Seahorse is a small fish that is fascinating. There are about 35 species of seahorse. the largest can be 30 cm, the smallest four cm long. One seahorse has the record as the world's slowest fish. It swims by 0,016 km/h villket is 16 meterin one hour. Its way to reproduce itself is special. The females have eggs and this is what defines a female. The female lays eggs in the male's belly where they are also fertilized. 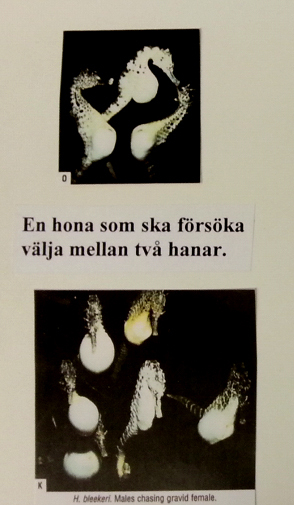 After a month, the development of the eggs, it's time for the hatched seahorses to "be born". 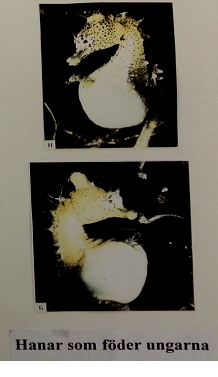 The lower picture shows five males courting a female who wants to lay eggs.